How are prices worked out? Prices vary depending on product weights, types and delivery locations (shown on the map). For instance, a length of tile trim is light enough to go via Royal Mail but too long, so must go by courier. 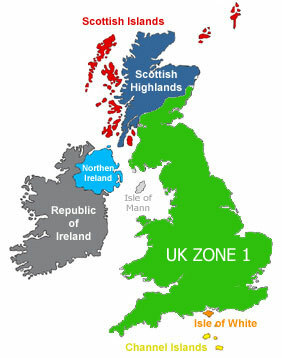 Scottish highlands and offshore we offer Royal Mail '1st class Signed For' delivery from £4.30 (This is a limited service since Royal Mail's introduction tightly monitored package size restrictions). UK Zone 1 courier delivery is just £4.99 (£6.99 if any 2.5m lengths are included like tile trim etc. ), qualifying for FREE DELIVERY if your order exceeds £200 before VAT. Other areas starting from £9.99. How do I calculate my delivery price? Simply add your choice of products to the basket then click 'My Basket' at the top of any page. On the basket summary page (see screen-shot below) select your country (and post code for United Kingdom). Click 'Get a Quote' and best delivery prices automatically display. 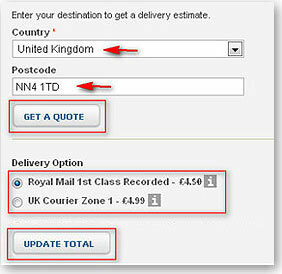 To include the delivery in your grand total select a delivery choice and click 'Update Total'. Our Courier (DPD or Tuffnells) delivers weekdays 8:00am - 6:00pm Saturday available to UK mainland by special request at additional cost - please call 01455 230 555. Example2: An order on placed on a Friday before 4:00pm it will be delivered on Monday, but if it were placed after 4:00pm it would be delivered on the following Tuesday.